Based on the book series by Phillip Reeve, Mortal Engines takes us to a post-apocalyptic future where vast tracked predator cities circle a radically altered Europe, preying on other cities for resources. Dripping in steampunk style, and with significant involvement from Peter Jackson and the team behind Lord of the Rings and The Hobbit, could Mortal Engines be the next great series of books to make it to our screens? When Hester Shaw (Hera Hilmar) boards the wheeled city of London to avenge her mother’s murder, her attempt on the life of the Head of the Guild of Historians, Thaddeus Valentine (Hugo Weaving), fails. Shaw and an apprentice historian (Robert Sheehan), find themselves cast off the great city, on foot they must survive and attempt to stop a weapon from the past, from once again threatening the world. Stunning art direction and costuming bring a sense of life to this complex world of massive moving cities in a far flung post-apocalyptic future. There is a genuine sense of beauty in how the costuming, set, and vehicle design help you see the distinctive vision from Reeves original work. You really notice director Christian Rivers’ background in the art department of Jackson’s previous works, as here that same meticulous care is expressed, to bring this steampunk fantasy to life. Unfortunately that is the only life in Mortal Engines. The plot lumbers monotonously forward like a giant mechanical city on a mud flat, a vast hollow hulk grinding ever onward. The cause for this lack of verve is twofold. Firstly Peter Jackson, Fran Walsh, and Phillipa Boyen (the writing team behind Lord of the Rings and The Hobbit films), have delivered a script that is dense in exposition and world-building, but bereft of any emotional resonance and deviating significantly from Reeves original novel. Secondly, the young cast have no spark, with the two leads producing leaden performances. Hera Hilmar’s merely trips from one extraordinary ponderous encounter to the next, displaying sullen determination, while Robert Sheehan (Misfits, Three Summers) once again fails to bring any charisma to his big screen role (despite being very solid in small screen endeavours). However it’s hard to blame them, when even veteran actors like Hugo Weaving are producing nothing more than pantomime grade performances. None of these issues are helped by first time director Rivers. He leans into the worst excesses of his mentor’s (Jackson) film making style, overplaying the score, or lingering too long on a shot – emphasising the melodrama at the heart of Mortal Engines. At best its hackneyed, at worst, unintentionally comical. He fares better with the action sequences, but it is hard to escape the opinion that we’ve seen these sequences before. 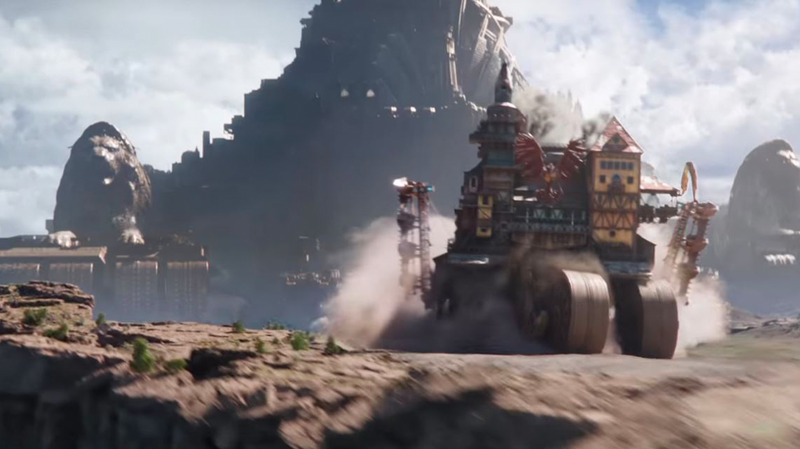 All of which leaves Mortal Engines a beautifully conceived film from an art and design standpoint, and a bitter disappointment in almost every other aspect. It feels like the last lumbering dinosaur of the YA dystopian genre, and a failed attempt to launch steampunk to the public at large.